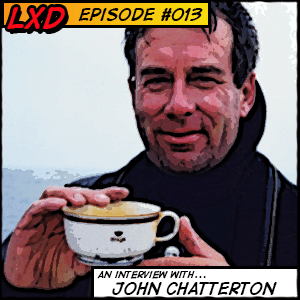 In this episode of The League of Extraordinary Divers I chat with John Chatterton, legendary wreck diver, star of Shadow Divers, and host of Deep Sea Detectives. After time served in the military John had an epiphany one evening to become a commercial diver. He went to commercial diving school and to get better at diving he joined up with a group of wreck divers in the northeast United States. Quickly John became a natural at the proper planning and preparation necessary to explore and salvage the most dangerous wrecks in the U.S.
John’s passion has been in researching, locating, and diving shipwrecks. His discovery and identification of the German submarine U-869 off the coast of New Jersey was the subject of a television documentary called Hitler’s Lost Sub. This same story was turned into a bestselling book by Rob Kurson, Shadow Divers. Chatterton and his longtime friend John Mattera, are the subjects of another Rob Kurson book, Pirate Hunters, recently published by Random House. The book tells the story of their search for a 17th Century pirate wreck in the Dominican Republic, where John spent several years. Recently, Universal Studios has contracted film rights to both Shadow Divers and Pirate Hunters. John was one of the co-hosts for 57 episodes of the History Channel’s Deep Sea Detectives television series, and has worked as a consultant to 20th Century Fox, Paramount Pictures, Universal Studios, and CBS. He was also a member of the first technical diving expedition to Ireland and the legendary wreck of the RMS Lusitania in 1994. A few years later, at a depth of 400 feet, he was the first diver to use rebreather diving technology on the wreck of HMHS Britannic. Chatterton has also managed to make over 160 dives to the well known wreck of the Andrea Doria, south of Nantucket Island in the North Atlantic. For literally hundreds of years searchers have tried to unravel the secrets of the mysteries surrounding Oak Island, in Nova Scotia. In 2015, John was contacted to dive to the bottom of the difficult and dangerous 10X Shaft on Oak Island, for the History Channel program, Curse of Oak Island. In 2016, he returned to Oak Island, this time to dive Borehole C-1. Chatterton lives in Boca Raton, Florida, where he also trains technical divers. Thank you for joining me again. Do you want to give a shout out to our guest on this podcast? Leave a note in the comments section below! Also, please leave an honest review for The League of Extraordinary Divers podcast on iTunes. Ratings and reviews are extremely helpful and greatly appreciated! And, don’t forget to subscribe to the show on iTunes to get automatic updates. The post LXD 013 : John Chatterton – Shadow Diver, Wreck Legend, Host appeared first on ScubaGuru.